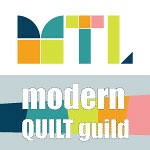 My May goal for A Lovely Year of Finishes was to quilt Four-Patch-Flip... and I made it! :-) Here she is all quilted and finished. Yay! I pieced this top back in December 2011 and it had been sitting in my pile of tops ever since. It was definitely time for this beautiful top to get quilted. 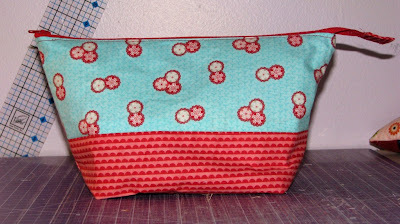 The fabrics are from the Hometown collection by Sweetwater for Moda and the blue accent fabric came from my stash. 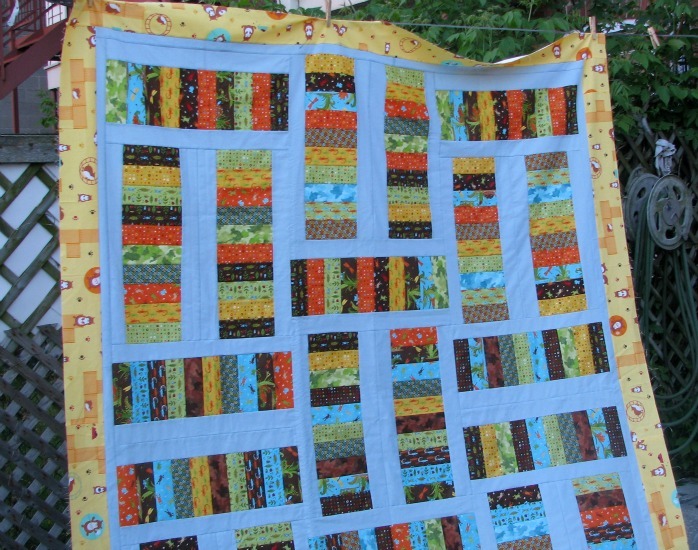 The pattern is from the book "Layer Cake, Jelly Roll & Charm Quilts" by Pam and Nicky Lintott. It finishes at about 54" x 72" - the perfect size for snuggling under while watching TV or a good movie. 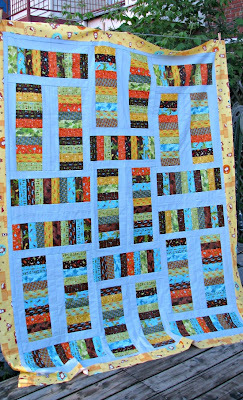 I quilted it with pebbles and flowers - which I learned from the Angela Walters Craftsy class - and some wandering clovers (a Leah Day design) in the border. 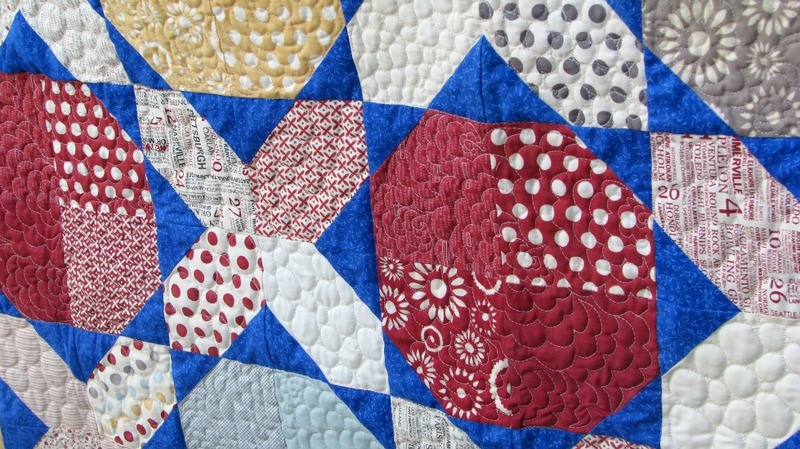 I loved quilting these designs. There's something very zen-like about doing pebbles and flowers. I am super happy and proud of this finish. 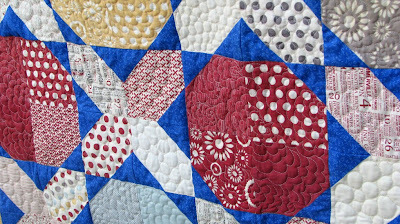 I love the fabrics, the pattern and I especially love the texture of all that quilting. It is awesome. 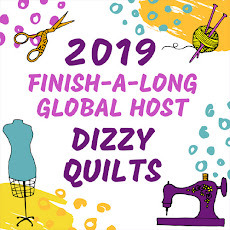 I will be linking up over at Crazy Mom's Quilts for Finish it Up, at Lucy's for TGIFF and over at Fiber of All Sorts for ALYOF. Have a wonderful weekend everyone and thank you for stopping by! I didn't get much sewing done last week because of my trip to Dallas but I've sure made up for it this week! I've got 3 projects to share this week for WIP Wednesday. First, I finished Dylan's quilt top on Sunday night. You can see pictures of the quilt top here. I have to find a backing fabric for it now and get ready to quilt it. That's going to be at the top of my list for June. Next, I started piecing the May Schnibble - Gentle Art. I chose two charm packs of the Tapestry collection by Fig Tree & Co for Moda. I decided not to do the pieced border. I like it just like it is now. 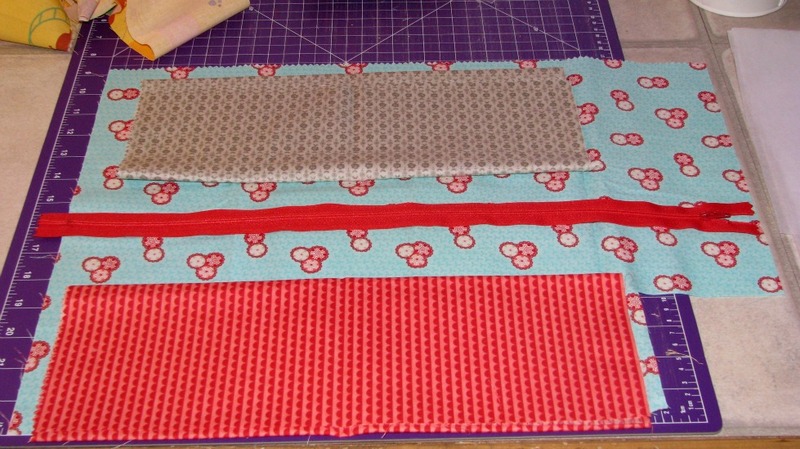 I'll choose a nice dark fabric for the binding and it should be pretty nice. 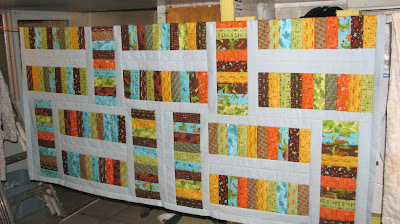 And finally, I finished quilting Nine-Patch Flip over the weekend. You can't really see it well on this picture, but I quilted pebbles, flowers and wandering clovers. 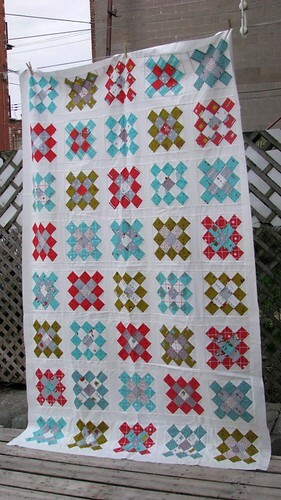 The design of the quilt was perfect to practice my FMQ because each block was very clearly defined. 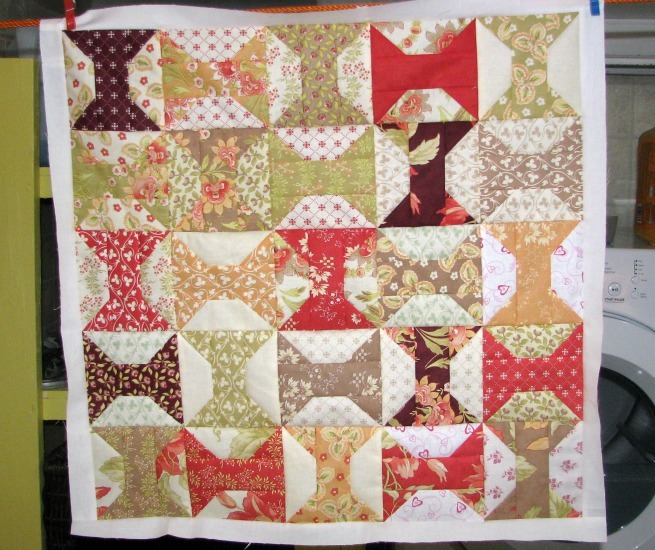 I've got the binding all ready and should be able to post pictures of this quilt all finished by end of week. 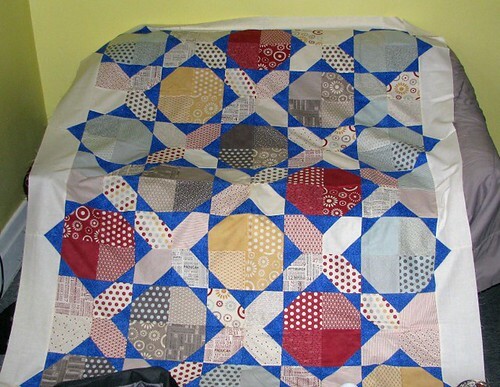 If you would like to see pictures of the quilt top before quilting, you can go here. I'm back from Dallas! I had the most wonderful, but also the most tiring trip. I learned lots, got to meet some really interesting people and most importantly, I got to spend time with colleagues and friends I rarely see. So it was an all around successful trip! But I'm happy to be home. I couldn't wait to get back to my sewing machine and finish Dylan's quilt top. And here it is! I love it and thankfully, so does Dylan. :-) I love the blue background. I wasn't sure about the yellow border fabric I chose at first, but Dylan loves it so it's definitely staying. I was hoping to have it all quilted for his birthday (he turned 9 today), but with the trip and everything else, I only managed to get the top done. The quilting will have to go on my To Do List for June. Yesterday, I posted a picture of the fabric I was using to make myself a new open wide zipper pouch based on Noodlehead's pattern here. I'm happy to say that I finished the pouch last night and it's AMAZING! I love it. I tried making it with a contrasting bottom and I'm super happy with how it looks. I also used interfacing this time around (I didn't with the first 2 pouches I made back in January) and it holds its shape much better. 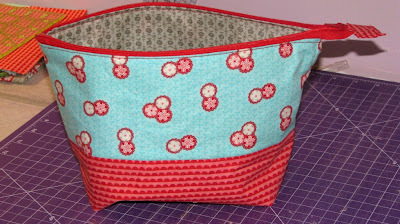 I used a cute grey fabric for the lining (all fabrics are from the Ruby collection by Bonnie & Camille for Moda). The medium size is perfect for all of my make-up as well as the travel size bottles of shampoo, shower gel, etc. So I'm all set for my short trip to Dallas this weekend! Linking up at AmandaJean's for Finish It Up and at Ms. Midge's for TGIFF! Have a fabulous weekend everyone and I'll see you back here next week when I'm back from the conference. My last post was a week ago. I just didn't have much to say over the last week. I've been reading all the blogs I follow and I'm amazed at all the wonderful things I see popping up all over blogland. There are some ridiculously talented quilters out there. In my last post, I mentioned I had lost my sewing mojo - the weather had been beautiful and I just didn't feel like being inside. Over the last 7 days however, I've gotten motivated to get back to sewing again. Probably because work and home have been incredibly stressful lately and I need to spend some time doing what relaxes me most - and that is quilting and sewing. I tried to be at my sewing machine every day for at least an hour this week and have some real progress to show for it today. First, I spent a few hours quilting Nine-Patch Flip over the weekend. I unfortunately forgot my camera in the city so have no pictures to show you, but trust me, it's almost done! And it's a good thing too because I have to have it done for the end of the month (it's my LYOF goal for May). Second, I cut into the fabric I showed you in my last post and started putting together Dylan's quilt. I am quite literally in love with this quilt top. I love the colours in the Meadow Friends collection and I'm super happy with the Bella Cloud I picked for the background. I think it's perfect for my 9 year-old boy. All that's left now is to sew on the border and then quilt it of course. And finally, I started planning my trip to Dallas (I fly out on Saturday) and realized I didn't have a pouch big enough to fit my make-up, and other small essentials so I decided to make myself an open-wide zipper pouch. This is the fabric I chose - some Ruby by Bonnie & Camille for Moda. I decided to make the medium size pouch. 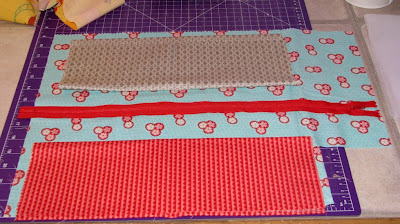 I will use the blue and red for the exterior and the grey is for the lining. I also had the perfect red zipper! I've got all the pieces cut and will be sewing it together later on today. 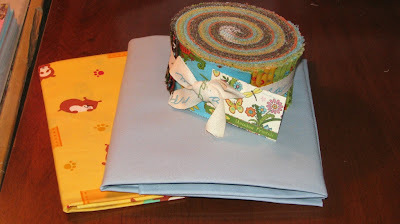 Linking up at Lee's for WIP Wednesday - click on the button in my sidebar to see all the WIPs! I hope you are having a fantastic week and thank you so much for visiting! 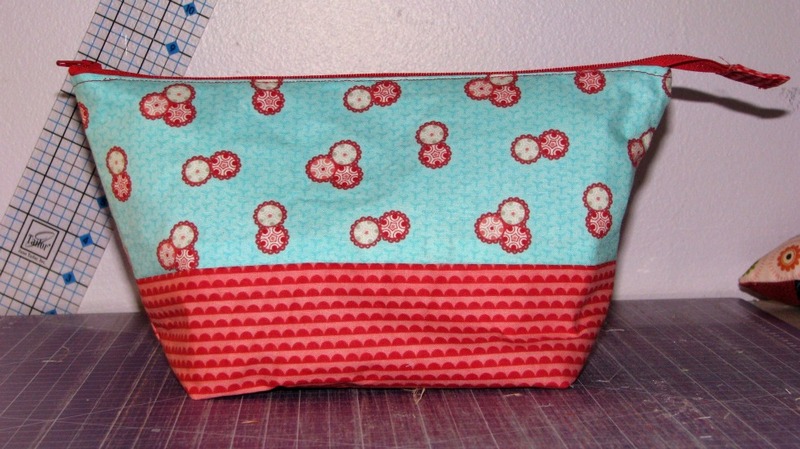 I haven't been doing much sewing lately. In fact, I seem to have lost my sewing mojo. 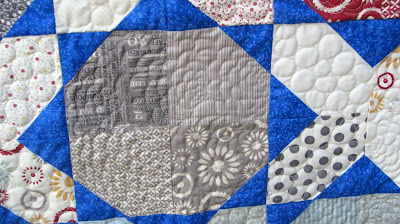 I haven't really touched my machine since Saturday and even then, I only quilted a couple of squares on Nine-Patch Flip. The weather has been so nice around these parts for the past week or so, I feel guilty staying indoors. The problem is I really have lots to do in the sewing room. I need to finish quilting Nine-Patch Flip. I purchased the pattern for this month's Schnibble and I picked my charm packs, but have yet to make a single cut. I also have to make a pincushion for a swap the Montreal Modern Quilt Guild is having in early June and I have to start planning for a challenge the Guild is organizing over the summer. 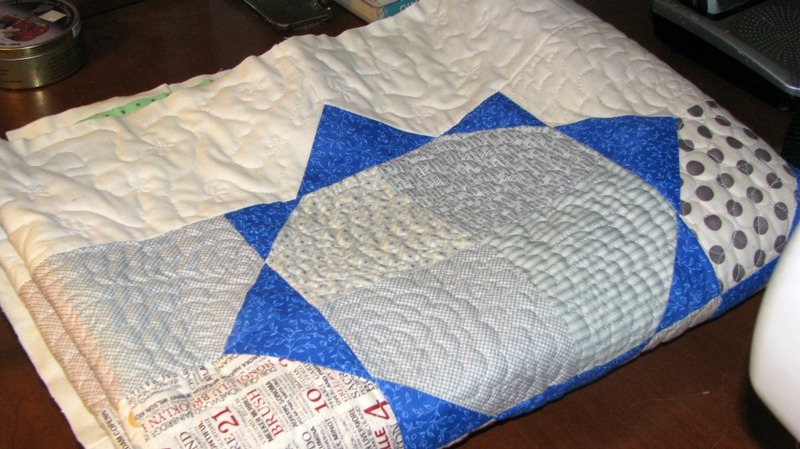 But most importantly, I promised my youngest he would get another quilt for his bed. So I HAD to get started on that one. 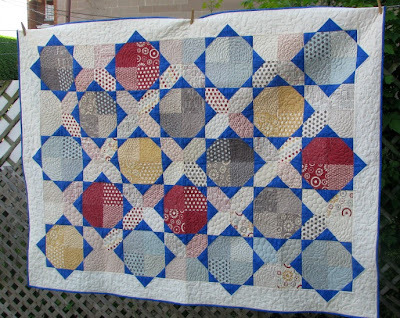 I've had a jelly roll from the Meadow Friends collection (Deb Strain for Moda) for a while now and decided it would be perfect for Dylan's quilt. So I ordered some Bella Cloud and some Pet Park (by Caleb Gray Studio for Robert Kaufman Designs). I chose to make a pattern from one of my books: Jelly Roll Dreams by Pam and Nicky Lintott. The design is called Stacks of Colour. This will be the first time I use a colour other than white or cream for the background. I cannot wait to see how it looks. I cut all of the fabric a couple of nights ago and I just need to get going on the actual sewing part now. The last item on my To Do List for April was finishing my Granny Squares top. I had to spend most of Sunday evening sewing, but I got it done! I used a Little Apples jelly roll and followed this method for piecing the blocks, but changed the pattern somewhat because I wanted a bigger quilt. Instead of using only half the strips in the jelly roll and make 20 blocks, I made 40 blocks in a 8 x 5 layout and omitted the border. I haven't measured it yet, but it's pretty big. I am super happy with this top. And I know it's not officially a finished quilt, but I'll be linking up at AmandaJean's for Finish It Up and at Quokka Quilts for TGIFF. And now for my May goal. This month, I want to finish quilting my Nine-Patch Flip quilt. I started quilting it last weekend so I'm making this my one goal for a Lovely Year of Finishes and will be linking up for that as well.